There is always one cabinet in a kitchen which is the work horse, here is mine. It is filled with my essentials, the favorite glasses, beat up sliver baby cups (sometimes you just need a shot of milk, the perfect size) and my collection of herbs and spices, most of them from Penzeys. They are based out of Brookfield Wisconsin, and, much to my delight, they have a store minutes from my parents home in Connecticut. You can look them up here: www.penzeys.com. Pictured above are some of my favorites—the Sate is a mixture of coarse flake salt, brown sugar, garlic, white onion, coriander, purple shallots, turmeric, sweet paprika, Ancho pepper, galangal, cayenne red pepper, and lemon grass. As you can see, they blend so you don’t have to. The other one is smoked Spanish paprika, which has such a deep lovely aroma and taste. Order a catalogue and explore more than 250 items. They also give recipes and background to many of their spice blends, which will give you the courage to try them out. Order their extra-fancy Vietnamese Cassia cinnamon; it’s amazing. It’s like you’ve never tasted cinnamon before! Have fun exploring! PS: Add a tablespoon of Sate to the hamburger soup recipe when you sauté the ground beef and onions – so good! 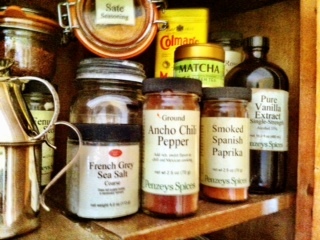 This entry was posted in Recipes and tagged cooking, Penzeys, Sate, smoked Spanish paprika, spices. Bookmark the permalink. There is a Penzey’s in Falls Church. We only use their spices at Mello Out. And I agree about the extra-fancy Vietnamese Cassia cinnamon. Awesome! Grand Central would have a Penzeys, they have everything!